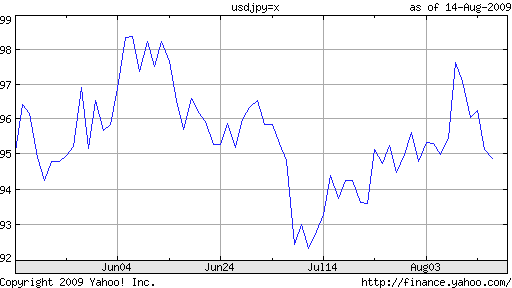 Just when it looked like the carry trade was back for good and all signs pointed to a Yen depreciation, out of nowhere came a series of surprise developments, propping the Yen back up. Spanning finance, economics, and politics – a Forex Trifecta – these developments moved swiftly through the markets, creating optimism for the Yen where before there was only pessimism. Of course, it’s possible that this bump will prove temporary, and a reversal could transpire just as quickly. 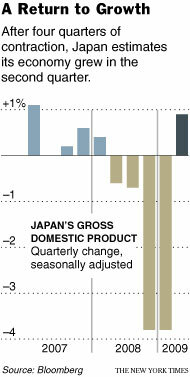 The biggest news, by a large margin, was a report that the Japanese economy had returned to growth. Similar in scale and in tenor to stories coming out of other countries, the data showed that Japan grew at an annualized rate of 3.6% in the second quarter of 2009, a sharp reversal from the 11.7% contraction in the previous quarter (which was itself revised upward from -14%). The sudden sea change was brought about by a combination of government spending and export growth. “New tax breaks and incentives to help sales of energy-efficient cars and household appliances, coupled with lower gas prices and a rebound in share prices, spurred consumer spending. Prime Minister Taro Aso has pledged 25 trillion yen (about $263 billion) in stimulus money, including a cash handout plan and more public spending on programs like quake-proofing the country’s public schools, to revive the economy.” Meanwhile exports grew by a healthy 6.3% from the previous quarter, while imports fell, causing the trade surplus to widen. The announcement of economic recovery was accompanied by a noteworthy reversal in capital flows, such that Japan’s capital account swung into surprise weekly surplus: “Foreign investors bought 292.9 billion yen ($3.1 billion) more Japanese stocks than they sold during the week ended Aug. 8 and domestic investors were net buyers of 125 billion yen in overseas bonds and notes.” Meanwhile, speculation is mounting that Japanese investors will move to repatriate some of the coupon and redemption payments they receive on their US Treasury investments. While seemingly unrelated to the economic turnaround (it’s important not to read too much into weekly data), this could be a sign that Japanese investors are growing more optimistic about domestic economic prospects and are moving to invest more at home. It’s worth noting that such a shift could actually be necessary if the recovery is to be sustained, in order to increase the role of (capital) investment, relative to exports and government spending. Ironically, it could instead be a sign of excessive pessimism, if Japanese believe that prospects for US/global growth have been overestimated, in which case risk appetite and the carry trade would be due for a combined correction. Along similar lines, the Democratic Party (which has a wide lead over the incumbent Liberal Democratic Party), has also conveyed its opposition to currency intervention, since such tactics inherently prioritize export growth over domestic consumption. “Japan’s export-led growth is reaching its limits and Tokyo should not intervene in markets to weaken the yen as long as currency moves match fundamentals, the No.2 executive in the main opposition party said on Monday.” Could the carry trade be in trouble?